Vijay’s latest movie, Mersal, directed by Atlee is breaking several box office records. The film till now has collected a whooping 157 Cr from its first five days. This includes 78.3 Cr from Tamil Nadu and 53 Cr from Overseas alone. Mersal is about the malpractices and greed in the medical sector. But the controversy started for another sector – GST. Which comes as a dialogue in one of the scenes. The local unit of India’s ruling Bharatiya Janata Party demanded removal of dialogues related to GST and Digital India, has increased the film’s popularity around the globe. Tamil Nadu BJP leader Tamilisai Soundarajan, and H Raja, have taken offence to some scenes in Vijay’s latest movie, Mersal. Tamilisai Soundarrajan accused Vijay of spreading false information because he wants to enter politics. In one of the scenes, Vijay’s character compares India to Singapore. Speaking about the tax rates and medical cover in the two countries. Anti-Modi or Anti-BJP wave is so strong in south of India, especially in Tamil Nadu and Kerala. The support Mersal and Vijay enjoying is not a one film wonder, but it happens all the time since last Election. Even in Kerala, where ‘any film against the LEFT’ used to face all the heavy lashes, Mersal is getting high support (from LEFT). Mersal is used by the politicians against BJP. The Malayalam film TP 51 Vettu based on the notorious murder of Revolutionary Maxist party leader T P Chandrasekharan, is yet to get a proper release. The film was allowed to release only in six government owned theatres. Another example is Left Right Left. Mersal is about the malpractices and greed in the medical sector. Anyway the actual message/topic the film discussed is overshadowed by the politicians from both the sides. The whole dialogue about GST cannot be said as ‘true to fact’ but it definitely says many things. Personally, I’m not impressed with the dialogue about GST. Anyway, those dialogues look good on screen! This is not new for Vijay as his recent movies has discussed about various issues surrounding us. The most powerful one has been in Kaththi, directed by AR Murugadoss. Note: His next film after Mersal is with AR Murugadoss. Religious: The whole issue and support is not exactly about GST. The TN BJP Leader H Raja mentioned ‘Joseph Vijay’, instead of the commonly used ‘Vijay’, in his tweet against Mersal. Now, that changed the whole topic. Now, he brought the ‘religious’ point unnecessarily. This is the biggest mistake of BJP down south. This religious card never before worked in Tamil Nadu nor Kerala. Vijay has huge fan following in these two states. And most importantly: Vijay has never covered his identity. This is evident in H Raja’s tweet itself which had a copy of Vijay’s letter head. Now what is the actual point H Raja was trying to make? Whatever. H. Raja has clearly messed the things for BJP in Tamil Nadu. It is not new to bring actor/director’s religion in a movie debate. This is no longer the art-friendly 1950s/60s where P. J. Antony could make a movie named Nirmalyam about velichappadu – an oracle or a medium between the Goddess and the worshiper in a Hindu temple. This is 2010s, people are too sensitive and media is feeding people with religious poison. During the release of Lijo Jose’s Angamaly Diaries (Malayalam), a BJP friendly channel in Kerala did the same, so is the popular pro-left channel reporter. I’m not a person who says ‘there is not a single film with propaganda’, but these are not. A propaganda film is a film that are made to convince the audience of a specific political point or influence the opinions or behavior of the viewer. We can see a lot of such movies in Hollywood, sometimes leading and sometimes misleading. Some points are deliberately added to the script, while some are not. Some of the most significant films ever made have been propaganda films, specifically because they have had an enormous impact on people. In South India, it is mainly the ‘actors’ who uses film as a medium to communicate with the mass, their fans. MGR used films to convey messages to the fans, so is Rajinikanth who continued using dialogues and songs to convey his messages and his political stand to the masses, this is followed by Vijay, Ajith… and then everybody following their footsteps. Most of such moments can be termed as ‘marketing gimmicks’ to entertain ‘fans’. How many such films really helped audience with good information or messages? Director S. Shankar films repeatedly pointed messages against ‘capitation’, ‘corruption’ and ‘bribery’. Now – the actual message/topic Mersal discussed is overshadowed by the politicians from both the sides. The director and the actor does deserve appreciation for taking up such a strong topic to discuss. Medical Sector: As mentioned earlier, Mersal, is about the malpractices and greed in the medical sector. The topic is so common among common people, and very rare in movies. S.P. Jananathan’s E is one hell of a good film in that case. KV Anand’s Maattraan is a similar one. Mersal is another one to be added. -> A News: More than 100 children have died at a public hospital in northern India amid allegations that the oxygen supply was cut over unpaid bills. Authorities continue to deny the charge. -> The Supreme Court has stayed National Consumer Disputes Redressal Commission’s order bringing free medical services provided by government hospitals within the ambit of Consumer Protection Act to make doctors and hospital liable to pay compensation for any kind of negligence. I wonder why BJP nor the opposition parties (nor the fans who are supporting Mersal) are discussing about the basic point of the movie, or say – the point which the whole movie discussed! I wonder why BJP and the opposition parties want to talk only about one/two lines of dialogue from the movie! With the political mess-up, Mersal gained enough popularity all around to make it reach more people and the points about Medical Sector is seeded in the viewers. The growth of Vijay from Ilayathalapathy to Thalapathy: The support Vijay and Mersal getting is huge. Right from Fans, Actors, Congress, DMK etc… National media went on to air the discussion in favor of the film and the actor. All the opposition parties started using ‘the issue’ as a weapon against Prime Minister Modi and BJP. 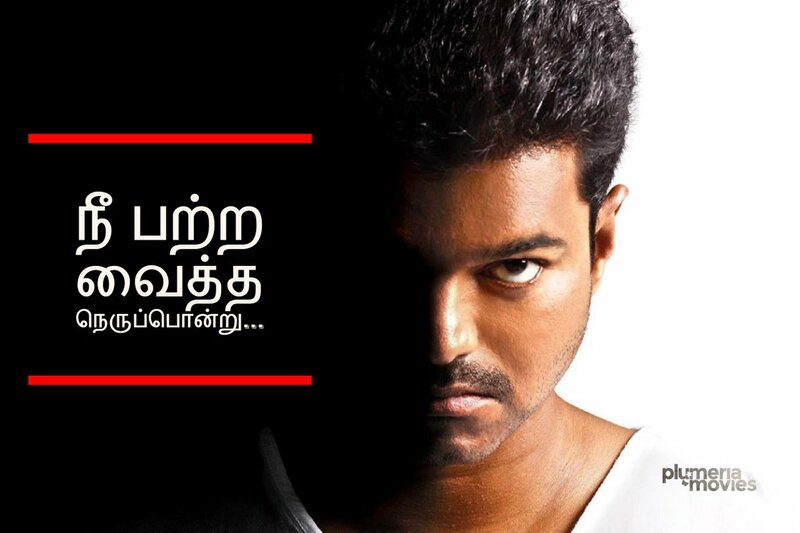 All these happenings increased the ever increasing popularity of Vijay. 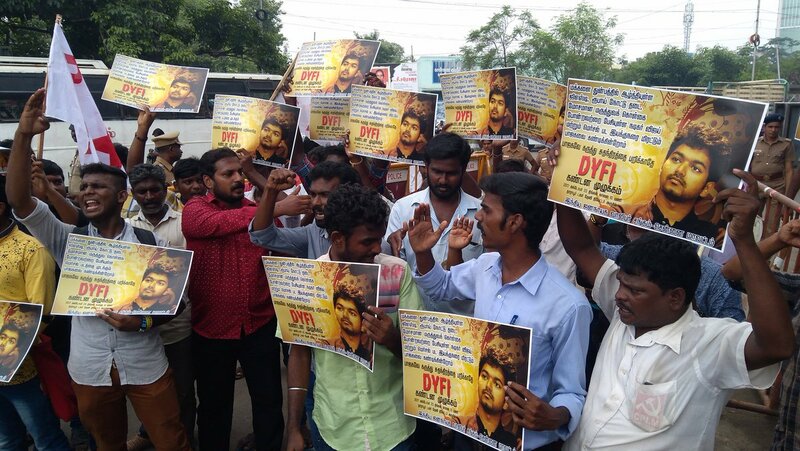 The more they oppose the film, the more support the film and Vijay gets. This events will help Vijay a lot, for his upcoming movies, as well as his political career (if he is into it). Coincidentally: Vijay’s poster and a famous mass song is used in the latest Bollywood release Golmaal starring Ajay Devgn. 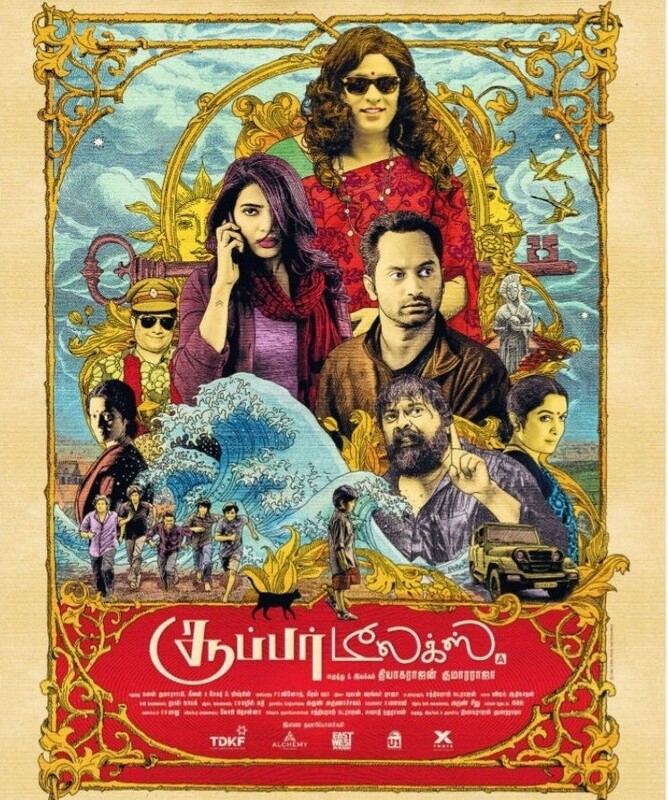 The film released just a couple of days after Mersal. Now what you call that? A superstar is here. Ranbir Kapoor And Katrina Kaif Coming Together For Raajneeti 2.